The Commissioner of Income Tax Jammu grants 50% exemption from payment of Income tax on all donations in cash to the organization U/S 80-G.
BALGRAN has a school facility within its premises. The school is named as Bal Bharti public school and was setup by the management in April 2000 which was formally inaugurated by then Dy. Chief Minister of the state. At present, Strength of students in various classes is 204 including 107 inmates of BALGRAN. Three student secured distinction in 10th class J&K Board examination -2018 including one student, who secured 90% marks. One child of 8th class got distinction in 2018. The school has nursery and kindergarten facilities also. These facilities are equipped with basic toys and learning tools for children below 5 years. 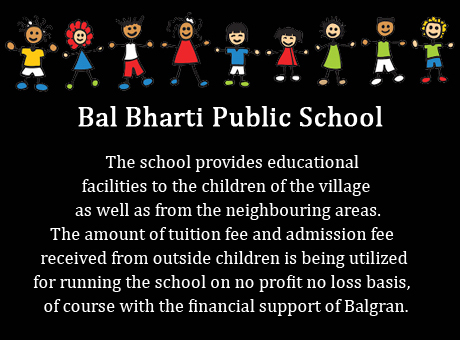 Apart from imparting academic education, Bal Bharti public school offers diversified exposure to the students in order to bring them up to a level of intelligent living with a flair for awareness. A computer centre has also been established within the school for imparting computer training to the children. The Balgran Charitable Trust was established in the year 1999 with five trustees who are Life Members of Balgran. The trust takes care of Higher education of the children as well as their rehabilitation. It also takes care of any medical treatment of the children, if so required as also the Marriage of girl inmates. Besides the Chairman, it has one Treasurer, one Member Secretary and two Members from the Life Members of the Balgran as trustees. A child specialist, Dr. Neelam Kohli, Deputy Director Health (Retd.) has been rendering free services. 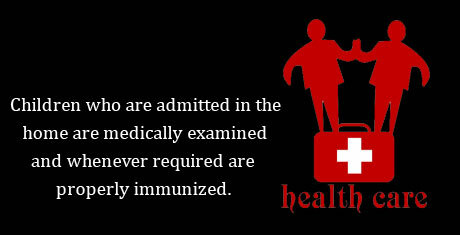 Children who are admitted in the home are medically examined and whenever required are properly immunized. Outside patients are examined and sample medicines if available in surplus are provided . A Dental Section on 1st floor of Health Centre has been set up. It is equipped with dental chair, X-ray and other allied accessories Dr. Vishali Sambyal has been engaged for Dental Clinic. Consumables required for various dental procedures are purchased from the market. It caters for our inmates and outside patients are also provided dental treatment at subsidized rates. Cutting / Tailoring and embroidery centre is functional Sr. Girl inmates stitch their own clothes. Repair of clothes is also carried out in the centre. The inmates make various items such as bags, handkerchiefs aprons, sofa covers, woolen socks etc . These are exhibited on different occasions for sale. Separate computer centres for boys and girls inmates are functional within the premises of Balgran. These centres are fully equipped with computers and furniture for imparting basic computer training to our inmates.